A while ago (longer than I really wish to admit! ), Boy 2 asked if he could have a ‘Green Triangle quilt please, Mummy’. Of course, other things kept coming up and although I kept buying green fabrics when I saw them, I didn’t really make much progress!!! At the beginning of this year though, I decided that now was the time! I pulled out all the fabrics, looked at the notes I’d scribbled myself and set to for a massive chopping session. And then realised that my size measurements were based on when Boy 2 was a toddler, and promptly had to cut a load more!!!! At least it should last him a good while now!!! In all, I cut a total of 205 triangles (for anyone that’s interested, the finished quilt measures 46″ x 68″) using the EZ equilateral 60* triangle which made life so much easier! 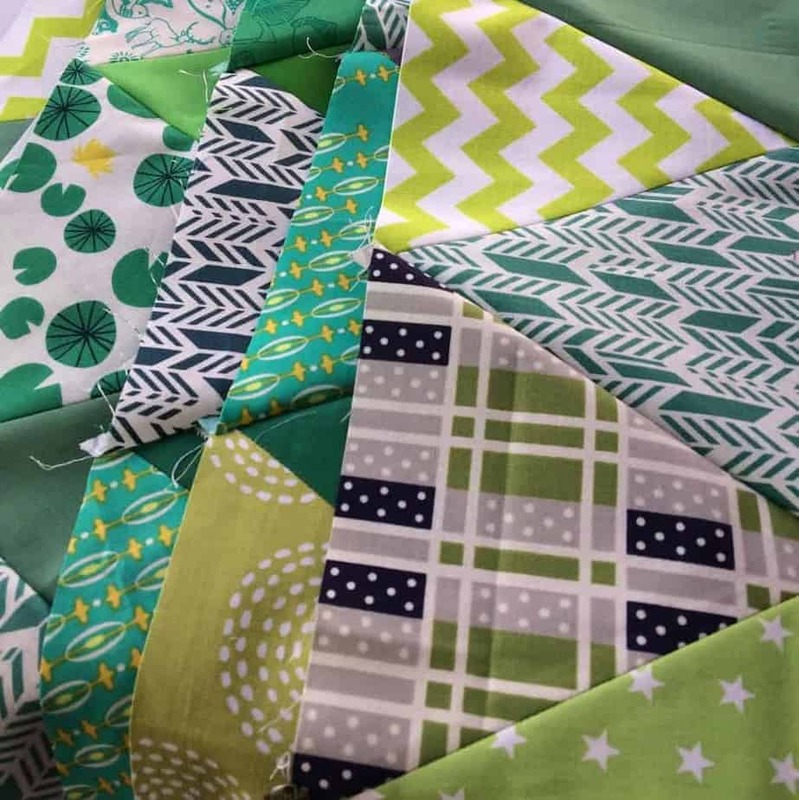 I cut strips of fabric 5.75″ wide from a FQ and then sub-cut into triangles using the template. I used a mix of solids and patterns and I think they work quite well together, especially with the patterns allowing me to introduce a few different colours other than just green! 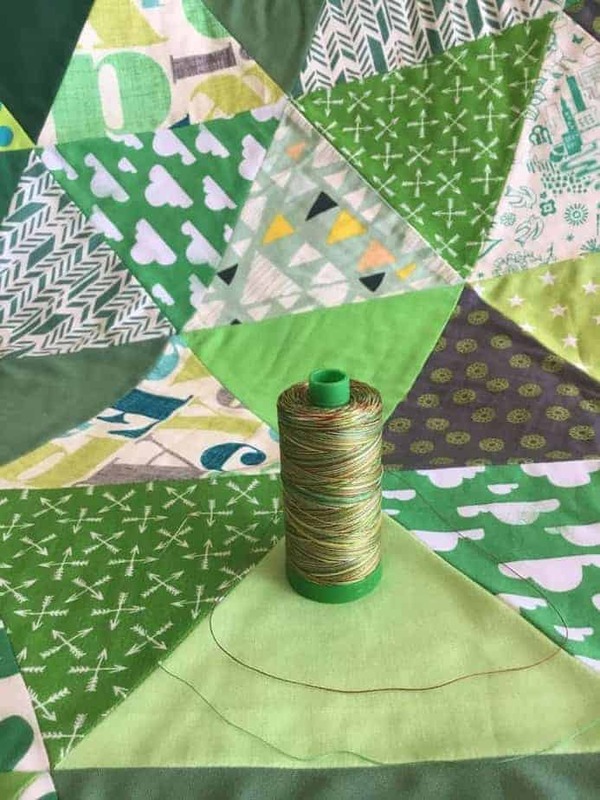 Piecing triangles is not too tricky – particularly if you’re using the template as it helps with lining them up – but in joining the rows I did have to let go of my inner perfectionist slightly! I’m not going to pretend that all of my points are perfect, but using lots of pins at each of the joining points certainly helped to get them generally okay! When it came to quilting, I was a bit stumped, as my wadding roll has run out. I had a look around and came across the Dream Green wadding over at Cotton Patch as an environmentally friendly alternative which I decided to try out, given the growing concern about the amount of single use plastic that we are generating in our world. The wadding is made from recycled plastic bottles and for each pack that you buy, it tells you how much has been saved from landfill – this king-size pack is the equivalent of 28 plastic bottles! The wadding has a slightly green tinge to it, with a few streaks and I have to confess that if I was working on a quilt with a lot of white negative space I would be a little bit nervous about it showing through. Having said that, it looks greener when it’s all rolled up, but once it’s a single layer, it’s almost imperceptible. Certainly, one to check before basting the entire quilt though! The Dream Green has a lovely soft texture to it, doesn’t shed too many fur balls and quilts beautifully. I felt a little bit nervous about it (I’ve always used a cotton batting) but overall I was really impressed. It has a slightly firmer structure to it that the cotton wadding – maybe you can see in the picture above how it stands more upright? Unlike some waddings’ I’ve worked with, there’s no obvious wrong/right side that I could see and the projects that I’ve washed have all come out really well with no greater than expected shrinkage, which is always a good thing! There are only a couple of things that I’m a bit uncertain about: packaging wise, the wadding is sent in a plastic bag and, because I ordered it online it was sent in a further plastic bag. I couldn’t see any information on the Dream Green leaflet or the packing to say that it’s recyclable, so overall I probably came out as environmentally neutral in making this purchase, which is better than negative but there is maybe still room for improvement? I also felt that there was some slight stretching of the wadding whilst basting some of my larger quilts, although I need to make a few more projects to confirm for sure. I admit that basting quilts is not something that I’m fantastic at. I baste my quilts on the kitchen floor, taping the edges down and using 505 spray, and noticed that on a couple of larger projects where I’m smoothing the quilt top over the wadding – and admittedly crawling around on top of the quilt! – I’ve ended up with slight ripples (or lettucing?!) around the edges of the wadding, and I’ve wondered if this is due to the synthetic nature of the material? And it doesn’t seem to have the same ‘bounce back’ as the cotton waddings I normally use. 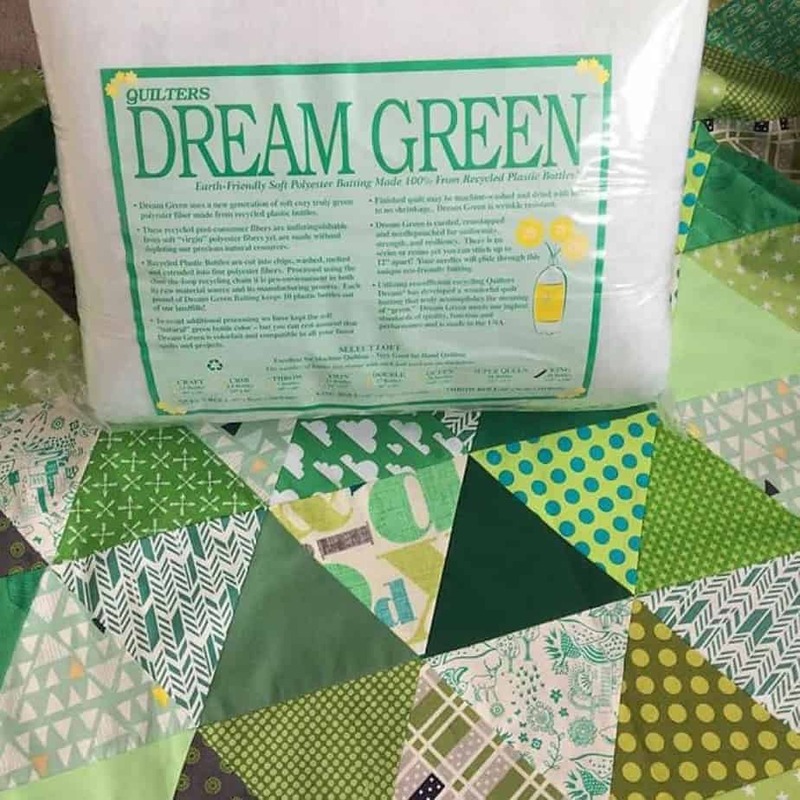 Like I mentioned, I’ve been really happy with the quality and feel of the Dream Green and would use it again but for a bigger quilt, I would probably use my normal wadding until I’ve nailed a better technique of basting! Quilting wise, I used a variegated Aurifil thread and serpentine stitched following the lines of the triangles. It means that even from the back Boy 2 cannot argue about whether or not it is triangle-y enough!!! Have any of you used Dream Green? Or have any extra tips on how I can up my basting game?! Today’s sky:::: cloudy and blue but beautifully warm!